Wei H, Guo P (2016). Carbohydrate metabolism during new root growth in transplanted Larix olgensis seedlings: post-transplant response to nursery-applied inorganic fertilizer and organic amendment. iForest 10: 15-22. Sustainable agriculture often requires the incorporation of organic matter into cultural protocols as an amendment to mitigate problems caused by chemical inputs, but the responses of transplanted seedlings to such additions have not been well quantified. In this study, bare-root Changbai larch (Larix olgensis Henry) seedlings were applied with 100 or 200 kg nitrogen (N) ha-1 of inorganic fertilizer with or without chicken manure added at a rate of 10.000 kg ha-1 during nursery cultivation, obtaining four treatment combinations designated as F100+, F200+, F100-, and F200-, respectively. Over-winter seedlings were transplanted into pots and placed in a growth chamber, where the carbohydrate metabolism, biomass accumulation, root respiration, and new root number were quantified. Both initial soluble sugar and total non-structural carbohydrate (TNC) accumulation were the lowest in the F100+ treatment. However, two months later, root soluble sugar content was the highest in this treatment, while coarse-root (diameter > 2mm) carbohydrate content was the highest in the low rate of inorganic fertilizer treatment. During the two-month post-transplant period, the net carbohydrate accumulation rate (NCAR) for starch was negative for all treatments, but the NCAR value for soluble sugars was the highest in the F100+ treatment at both the root and whole-plant scales. Relative to the F200- treatment, the NCAR value for soluble sugars, final sugar content, and biomass accumulation in coarse roots, respiration rate of fine roots (diameter ≤ 2 mm), and new root number were all greater in the F100+ treatment, while new root number was increased by organic matter additions. In conclusion, the use of chicken manure as an organic amendment had the potential to enhance transplanted larch seedling performance by improving post-transplant new root number, but this application must be considered within the context of the interaction between organic amendment treatments and inorganic fertilizer applications. Container volume and growing density influence western larch (Larix occidentilis Nutt.) seedling development during nursery culture and establishment. New Forests 45 (2): 199-213. Root response along a subambient to elevated CO2 gradient in a C-3-C-4 grassland. Global Change Biology 16 (1): 454-468. Growth, gas exchange, and root respiration of Quercus rubra seedlings exposed to low root zone temperature in solution culture. Forest Ecology and Management 253(1-3): 89-96. Relationship between frost hardiness, root growth potential, and photosynthesis of nursery-grown white spruce seedlings. Annals of Forest Science 68 (8): 1303-1313. Effects of root diameter and root nitrogen concentration on in situ root respiration among different seasons and tree species. Ecological Research 25 (5): 983-993. Seasonal changes in non-structural carbohydrates and sucrose metabolism enzymes in two Sabina species. Acta Physiologiae Plantarum 34 (1): 173-180. Root and shoot biomasses in the tropical dry forest of semi-arid Northeast Brazil. Plant and Soil 378 (1-2): 113-123. Root growth dynamics of Aleppo pine (Pinus halepensis Mill.) seedlings in relation to shoot elongation, plant size and tissue nitrogen concentration. Trees - Structure and Function 24 (5): 899-908. Why do large, nitrogen rich seedlings better resist stressful transplanting conditions? A physiological analysis in two functionally contrasting Mediterranean forest species. Forest Ecology and Management 260 (1): 71-78. Organic matter added to bareroot nursery beds influences soil properties and morphology of Fraxinus pennsylvanica and Quercus rubra seedlings. New Forests 31: 293-303. Relation between nitrogen status, carbohydrate distribution and subsequent rooting of Chrysanthemum cuttings as affected by pre-harvest nitrogen supply and cold-storage. Annals of Botany 85 (5): 687-701. Nitrogen- and storage-affected carbohydrate partitioning in high-light-adapted Pelargonium cuttings in relation to survival and adventitious root formation under low light. Annals of Botany 94 (6): 831-842. Response of post-storage carbohydrate levels in Pelargonium cuttings to reduced air temperature during rooting and the relationship with leaf senescence and adventitious root formation. Postharvest Biology and Technology 47 (1): 126-135. Exponential nutrient loading shortens the cultural period of Larix olgensis seedlings. Scandinavian Journal of Forest Research 28 (5): 409-418. Tree-growth analyses to estimate tree species’s drought tolerance. Tree Physiology 32 (2): 178-187. Seasonal changes of activity of a starch granule bound endoamylase and of a starch phosphorylase in poplar wood (Populus × canadensis Moench ’ÂÂRobusta’) and their possible regulation by temperature and phytohormones. Journal of Plant Physiology 156 (5-6): 731-740. Characterization of heavy metals in livestock manures. Polish Journal of Environmental Study 22 (4): 1257-1262. Growth and nutritional response of hardwood seedlings to controlled-release fertilization at outplanting. Forest Ecology and Management 214: 28-39. Relationships between root respiration rate and root morphology, chemistry and anatomy in Larix gmelinii and Fraxinus mandshurica. Tree Physiology 33 (6): 579-589. Growth and physiology of deciduous shade trees in response to controlled-release fertilizer. Scientia Horticulturae 135: 71-79. Carbon and nitrogen allocation patterns of Douglas-fir seedlings fertilized with nitrogen in autumn. I. Overwinter metabolism. Canadian Journal of Forest Research 16 (5): 897-902. Winter survival and deacclimation of perennials under warming climate: physiological perspectives. Physiologia Plantarum 147: 75-87. Minimizing nutrient leaching and improving nutrient use efficiency of Liriodendron tulipifera and Larix leptolepis in a container nursery system. New Forests 43 (1): 57-68. Seasonal changes in starch and sugar content of poplar (Poplus deltoides × nigra cv. Dorskamp) and the impact of stem girdling on carbohydrate allocation to roots. Tree Physiology 30 (8): 979-987. Photosynthesis and respiration rates depend on leaf and root morphology and nitrogen concentration in nine boreal tree species differing in relative growth rate. Functional Ecology 12 (3): 395-405. Photosynthetic performance of an Arabidopsis mutant with elevated stomatal density (sdd1-1) under different light regimes. Journal of Experimental Botany 54 (383): 867-847. Carbon translocation patterns associated with new root proliferation during episodic growth of transplanted Quercus rubra seedlings. Tree Physiology 28 (7): 1121-1126. Fertilization at planting influences seedling growth and vegetative competition on a post-mining boreal reclamation site. New Forests 44 (5): 687-701. Evidence of old carbon used to grow new fine roots in a tropical forest. New Phytologist 182 (3): 710-718. Physiological characteristics and carbohydrate contents of spring-lifted Picea glauca bareroot seedlings following low-temperature storage. Scandinavian Journal of Forest Research 16 (5): 415-421. Effect of nitrogen load on growth and photosynthesis of seedlings of the hybrid larch F-1 (Larix gmelinii var. japonica × L. kaempferi) grown on serpentine soil. Environmental and Experimental Botany 83: 73-81. Leaching of mineral nitrogen and available phosphorus during culture of bareroot Larix olgensis seedlings under native fertilizer management in Northeastern China. In: Proceedings of the “Computer Distributed Control and Intelligent Environmental Monitoring (CDCIEM), 2011 International Conference”. Changsha (Hunan, China), 19-20 Feb 2011. Wiley-IEEE Press, IEEE Computer Society, Los Alamitos, CA, USA, pp. 1247-1252. Organic amendment and inorganic fertilization affect soil properties and quality of Larix olgensis bareroot seedling. New Forests 43 (2): 155-168. Nitrogen retranslocation, allocation, and utilization in bare root Larix olgensis seedlings. Journal of Forestry Research 23 (1): 87-94. Newly transplanted Larix olgensis Henry seedling with greater root biomass has higher early nitrogen flux rate. Soil Science and Plant Nutrition 59 (5): 740-749. Effect of late-season fertilization on nutrient reserves and carbohydrate accumulation in bareroot Larix olgensis seedlings. Journal of Plant Nutrition 37 (2): 279-293. 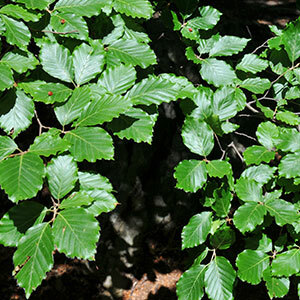 Correlated responses of root growth and sugar concentrations to various defoliation treatments and rhythmic shoot growth in oak tree seedlings (Quercus pubescens). Annals of Botany 107 (4): 653-662. Temporal patterns of soil CO2 efflux in a temperate Korean larch (Larix olgensis Henry) plantation, Northeast China. Trees - Structure and Function 27 (5): 1417-1428. The vegetation map of the People’s Republic of China (1:1.000.000). The Geological Publishing House (GPH) Press, Beijing, China. China’s forest policy for the 21st century. Science 288 (5474): 2135-2136. Effects of site preparation on emergence and early establishment of Larix olgensis in montane regions of northeastern China. New Forests 36: 247-260.